My 7yo co-author and I are freelance writers living in astounding Western Australia. We love where we live, we explore it, we embrace it, and we write about it. Located right in the middle of the Forrest Park Oval on the geographical divide between Highgate and Mount Lawley and within a short stroll of the gorgeous and always alive Beaufort Street, we have an outstanding hidden indoor and outdoor facility for the kids aged between 0 and 5. The premises belong to the city of Vincent, however they are generously shared with the community and form part of Playgroup WA. Inside of a large, well equipped and clean room, there are great kitchen facilities (full of supplies), a bathroom equipped with both the adults and the kids lavatories, as well as the changing table of course. There is a rather large craft room where all craft supplies are stored and can be used on as needed basis during your session times. There is also an outstanding toys room that has all the kids can dream of toys-wise. Opposite the toy room, there are a couple of comfy leather couches for the parents to take a break and relax with the cuppa whilst the kids are having too much fun! An outside space is worth a special mention as well. Whilst that space is a public facility and can be visited by anybody and at any time, it is fully enclosed, with the lock up gates allowing the playgroup kids to run free without a fear of escaping. Outside the gates, there is a massive Forrest Park Oval, which is also a public space and can be enjoyed by all, at any time. It is currently being used for soccer training on most days of the week by the Perth Football Club. However, there is always enough space for the playgroup kids to have a game of soccer as well, or go for a bike ride around the park. The facility and its surroundings are great at any time and during any season! 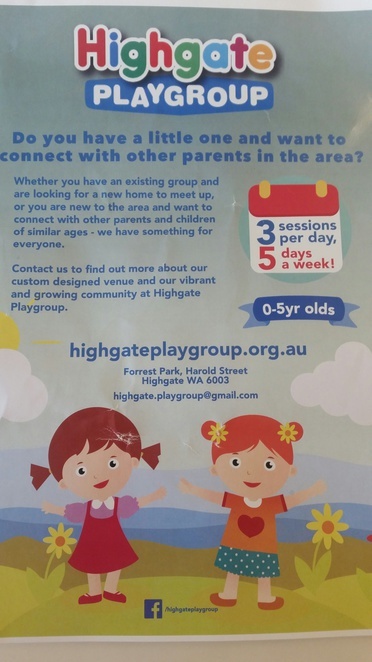 Subject to availability, anybody can become a member of this Playgroup. It is currently running 3 sessions a day, 2 hours in duration each, 5 days a week. You can opt to join one of the existing groups or create your own group, and join as a community (or mums' group). There is also one Saturday afternoon session, attended by the Russian-speaking kids and their families. This session is very popular (and rare) for bilingual kids of Russian, Ukrainian, Belorussian, Moldavian, Uzbek, Kazakh, etc backgrounds, and is a great opportunity for the kids to learn more about another culture, its cuisine and of course, the language. Once you become a member, the attendance is free all year around (during your designated session times) for members. The membership fee is $150 for the whole year per family, inclusive of insurance. The facility is run by the community through the committee of volunteers that meets once every school term. Improvements of the facility and purchases of new toys are discussed at those times. If you happened to live in the area, or are a frequent visitor – make sure you check this place out. Your kids will absolutely love it, and so will you! "The playgroup is very entertaining because there are lots of things to play with and do. There are also lots of crafts and games. It is good for little kids because there are a lot of toys and they can pick some to play with. It is also good for bigger kids because when the little kids have problems with building something, then big kids can help and join in play. There is also a book corner that has some wheeling chairs and mats and couches. We read the books and play. Everyone has a turn of cooking food and then everyone eats it. Even same food made by different people tastes different. There is also an outside playground, with swings, bars to climb on, slides and a big spider web. I also like it because it is very warm inside when the day outside is cold. It's very nice to have a birthday party there because you can make all sorts of fun games. You need to clean it after your session but it can be fun if big kids can help. I recommend for all people to go there. If you go, I think you will love it very much!"